I call this one "The Forbidden Soup". Canadian government officials consider it so dangerous that it is illegal to import it from Britain. I bet you are wondering what could be so dangerous about a soup that Canada would ban it. Well the dangerous ingredient is chicken stock. All meat products from the UK are banned in Canada because the Canadian Fool Inspection Agency (CFIA) is afraid that Canadian Mad Cow Disease might become contaminated by British Mad Cow Disease. Ok, I'll dismount from my soapbox now and talk about food instead. 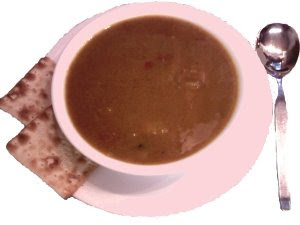 Mulligatawny is a traditional British curry soup. If you like curry and you haven't tried Mulligatawny before, now is the time to try it out. It is very easy to make and quite delicious. Chop the onion, apple and tomato and fry until the onion is golden. I curried favour with the boss of the house with this one [who threw that shoe?]. I read several recipes before deciding which ingredients to use for my Mulligatawny. My trusty Grandmother's recipe book from the 1950s suggested using coconut but left out the lentils. I didn't have any coconut in my kitchen cabinet anyway, but I recall eating Mulligatawny for the first time in a restaurant in England many years ago. My recollection is that it definitely had lentils in it. The flavour of the soup will be influenced by your choice of chutney. I recommend one of the fine selection of Patak Indian pickles or Shaw's chutneys available at Blighty's Tuck Store (what a surprise). PS: Can you spot the English style soup spoon in the picture? It's hard to find spoons like these in Canada.